The Teac P55 printer is a revolutionary new printing system featuring dye sublimation creating the highest quality, photo realistic thermal finished discs. The printed discs are durable, scratch free and waterproof. The colours are vibrant and images are photo realistic. With 400dpi resolution, the highest in the industry, the K2 Printer surpasses traditional screen printing quality and sets s new standard for thermal printing. 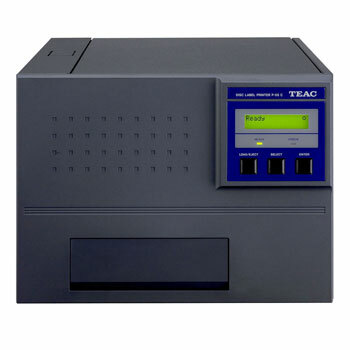 Whether you duplicated discs for audio, music, software, video or data, the Teac P55 thermal transfer disc printer delivers all the performance necessary for high volume, high quality disc printing. 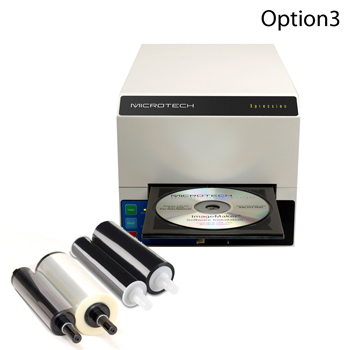 This printer fully intergrades with Microtech's range of Xpress Auto printers and you have superb unattended disc printing system 24/7 allowing a true production grade automation. The Xpression Printer brings professional quality to in house production of discs, enabling users to print permanent high quality single colour text and images directly onto the surface of discs. 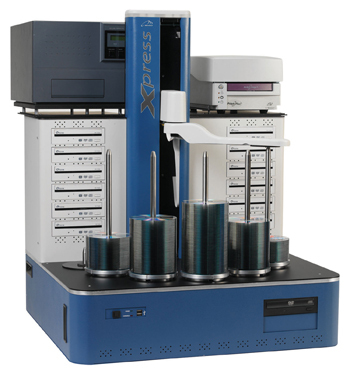 A cost- effective standalone or integrated media printing solution, the Xpression leverages established and reliable disc printing technology to provide an economical and fast direct disc print solution. Printer ribbon options include compatibility with industry standard thermal wax resin ribbons designed for high volume media printing. 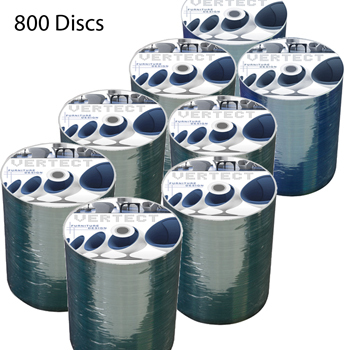 Using single colour black ribbons provide a minimum of 2100 discs per roll. Printing with the Xpression enables an industry-leading print cost of just $0.03 per disc. Paired with Microtech's Xpress family of automated disc duplicators and Auto printers, the Xpression provide fast, professional quality and unattended printing of discs 24/7. 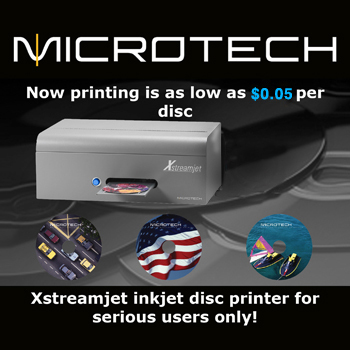 The Xtreamjet Printer is industrys first industrial strength, high volume continuous inkjet printer with lowest per disc print cost @ under $0.05! 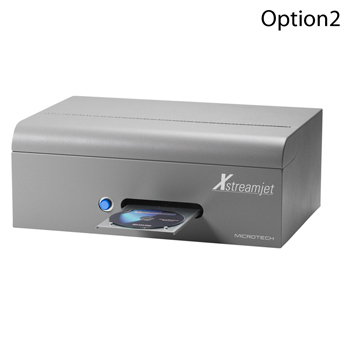 The Xtreamjet Printer brings professional quality to in-house production of discs, enabling users to print outstanding photo quality images directly onto the surface of discs. 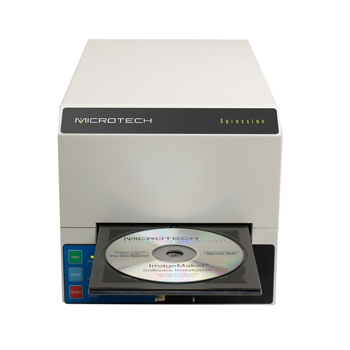 Paired with Microtech's Xpress family of Automated duplicators and Auto printers, the Xtreamjet provide fast, professional quality and unattended printing of discs 24/7. Whether you duplicated discs for audio, music, software, video or data, the Xtream jet printer will deliver industry-leading 4800 dpi print resolution and 16.7 million colours, your printed discs will have the sharpest text and graphics. Colours are vibrant, bright and photo quality.